Jazz in July takes you on an exploration of jazz that reaches deep into its roots to discover new horizons. Throughout the month of July, enjoy intimate jazz music at the Café 21 Living Room (Concourse) and lively, upbeat jazz tunes at the Music Station (Outdoor Theatre). Be dazzled by the soulful improvisations, swinging rhythms and the infectious grooves of our Singapore jazz artists. The SWS City Swing big band brings the house down with a diverse repertoire of jazz and swing! 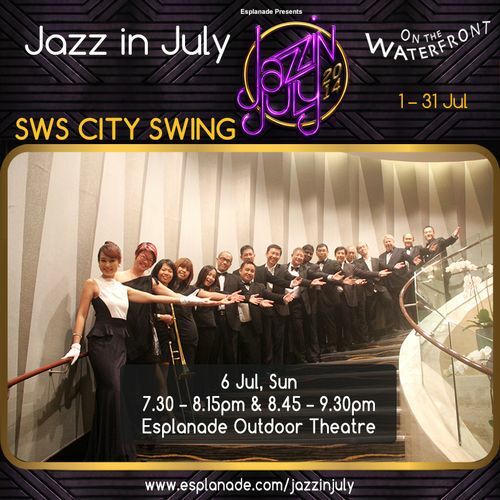 Led by Mr Subronto Hardjo, SWS City Swing gets you clapping, tapping and singing to great tunes from the past and present.